Two more players have committed themselves to Hastings United Football Club for next season. Sam Adams and Sam Cruttwell have opted to remain at The Pilot Field as new manager Garry Wilson and assistant Danny Bloor continue their squad building programme. The duo join Josh Pelling and former Lewes trio Sam Cole, Ollie Rowe and Jack Walder in having joined United ahead of the 2015/16 Ryman Football League Division One South campaign. Adams is coming off another successful season, which saw him finish as the club’s leading scorer with 13 goals in all competitions, as well as jointly topping the assist chart with seven. Although forced to miss a handful of games in the final couple of months, Adams still played a crucial part in United’s battle to avoid relegation, grabbing the only goal of a vital Easter Monday win at Ramsgate and then firing two more as the U’s beat Faversham Town in their final home fixture. Earlier in the year, the former skipper brought up a century of goals for the club and now stands on 103 in 387 career appearances. And at the age of 28, United supporters will be hoping for more of the same from Adams for many years to come. Cruttwell is another player with a bright future ahead of him, although he endured a frustrating and injury hit 2014/15 season, in which he was unable to fully establish himself in the starting XI, yet still made 39 appearances and contributed one goal and six assists. 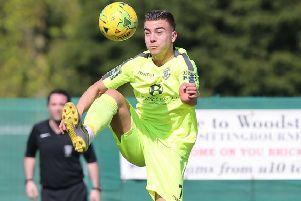 It remains to be seen what role the 18-year-old will be play next term, with left sided full-back Cole having already agreed to join the U’s, although Cruttwell certainly hasn’t looked out of place when played on the left wing, or even in central midfield, since making his debut in August 2013. Wilson has also confirmed two appointments to his backroom team. John Masters is set to retain his role as goalkeeping coach, which will see him continue to work with Pelling, while Dane Martin is also set to stay with the club as physio.